So what are the long-running programmes on UK radio still on air today? Yesterday when I posted about Desert Island Discs I originally wrote: “The UK’s second-longest running radio programme celebrates its 70th anniversary this Sunday on Radio 4”. In fact the first part of that sentence was utter bunkum, and has now been amended. I have ignored the news, weather and the shipping forecast here. Though Today in Parliament started on the Home Service in 1945 I’ve not established when Yesterday in Parliament first aired other than it was in the late 40s, so this would change my top 10. Paul Donovan’s book The Radio Companion states that Farming Today began as a weekly series in 1937 which would place it at number 4. However, the author of the Wikipedia article on the programme gives its first broadcast on Network Three in 1960. I have found evidence of an earlier occasional 10-minute talk series called Farming Today but for the most part the regular farming programmes consist of the morning Market Report for Farmers and magazine programmes such as Farm Fare and The Farmer. I have also left out Gardeners’ Question Time. This is listed as starting in April 1947 but at the time it was known as How Does Your Garden Grow?, changing its title to the present one at a later date, but I’m not sure when. An honorary mention should also go to The Week’s Good Cause which ran from 1926 until 1998 when it became known as Radio 4 Appeal. Of course not all these programmes have run continuously. Desert Island Discs itself had a five-year break between 1946 and 1951. In terms of the sheer number of programmes, The Daily Service, must take the record. The UK’s longest running record programme celebrates its 70th anniversary this Sunday on Radio 4 and around the nation on BBC local radio stations, Radio Scotland and Radio Wales. Here is another idea for a series. DESERT ISLAND DISCS. If you were wrecked on a desert island, which ten gramophone records would you like to have with you? – providing of course, that you have a gramophone and needles as well! The BBC top brass gave the programme the go ahead for an initial eight week run. The number of discs was reduced from 10 to 8 to fit into the half-hour timeslot. Three potential theme tunes were considered: By A Sleepy Lagoon by Eric Coates, Summer Afternoon Idyll by the same composer and incidental music to the play Mary Rose by Norman O’Neill. By A Sleepy Lagoon won out, with added seagulls. The first castaway was planned as Professor C.E.M. Joad, of Brain’s Trust fame, but he was unavailable so that honour went to comedian Vic Oliver, at the time appearing in the hugely popular radio show Hi- Gang! The first programme aired on the Forces Programme on 27 January 1942. Since 1942 there have been nearly 3,000 castaways (with a break between 1946 and 1951) with Arthur Askey having the good fortune, or perhaps misfortune, in taking top prize as being stranded on the desert island four times. The Desert Island Discs website has nearly 500 programmes available online to listen again. In this post I’m featuring two shows that currently aren’t available. Just three guests have been members of the British Royal family: Princess Margaret in 1981, Princess Michael of Kent in 1984 and David Linley in 2002. Here’s Princess Margaret’s show as broadcast on 17 January 1981. From 18 August 1984 this is part of the programme with comedian, cartoonist and writer Willie Rushton. (sound quality is not great). And finally a clip from a 1980 edition of Feedback in which Roy Plomley gets a ticking-off for not name-checking his castaways during the programme. Listen out for the Radio 4 programme on Vic Oliver this week. 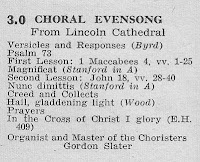 Though technically the longest-running record programme the show is sixth overall,with the record going to Chroal Evensong (1926). Should the Desert Island Discs website make these two shows available online in the future I’ll remove the above links. Few of today’s radio broadcasters can boast a career that extends for over half a century. 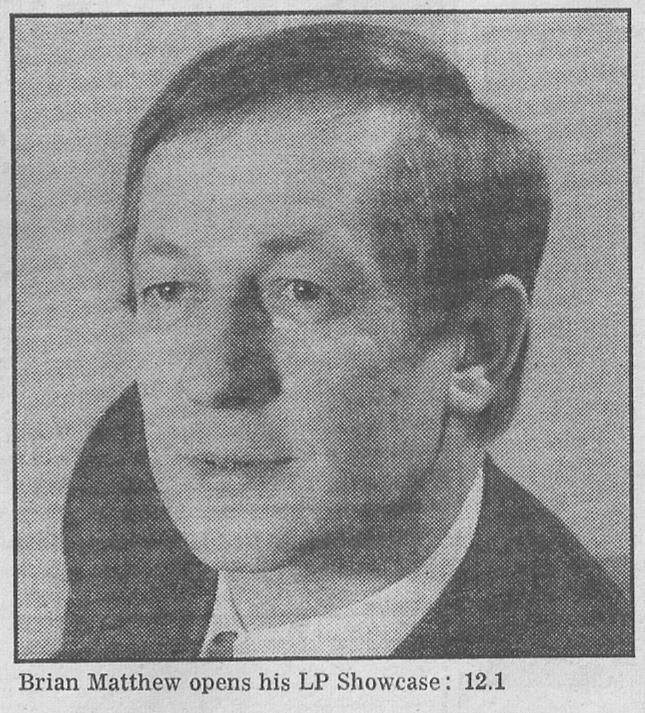 In that exclusive club is Brian Matthew, the subject of this post to coincide with The Brian Matthew Story on Radio 2 next week. Brian’s early broadcasting experience was with the British Forces Network in Hamburg in 1948-49 under the leadership of Raymond Baxter. Already showing a thespian streak Brian took part in some of the radio dramas that the unit produced, most notable of these was Trevor Hill’s adaptation of The Adventures of Robin Hood. It was, in retrospect, a starry cast: Brian played King Richard, Nigel Davenport took the lead, Cliff Michelmore was Little John, Baxter was Guy de Guisborne, Geraint Evans was the minstrel Blondel, Tom Singleton the Sheriff of Nottingham, Keith Fordyce played Will Scarlett. Bringing up the rear as the Foresters were Roger Moore and Bryan Forbes. The presence of Keith Fordyce is interesting as over the years their careers would cross many times. Back in civvy street Brian pursued his acting by training with RADA and then going into rep at The Old Vic (where he me this wife Pamela). Before long he was again trying his hand at radio with a job as presenter with Radio Netherlands Worldwide in Hilversum. In this clip you’ll hear Brian reporting on the effects of the winter floods of 1953. Returning to the UK still harbouring ambitions to be at the BBC he had to earn money as a milkman in Coventry before getting an audition as a staff announcer. 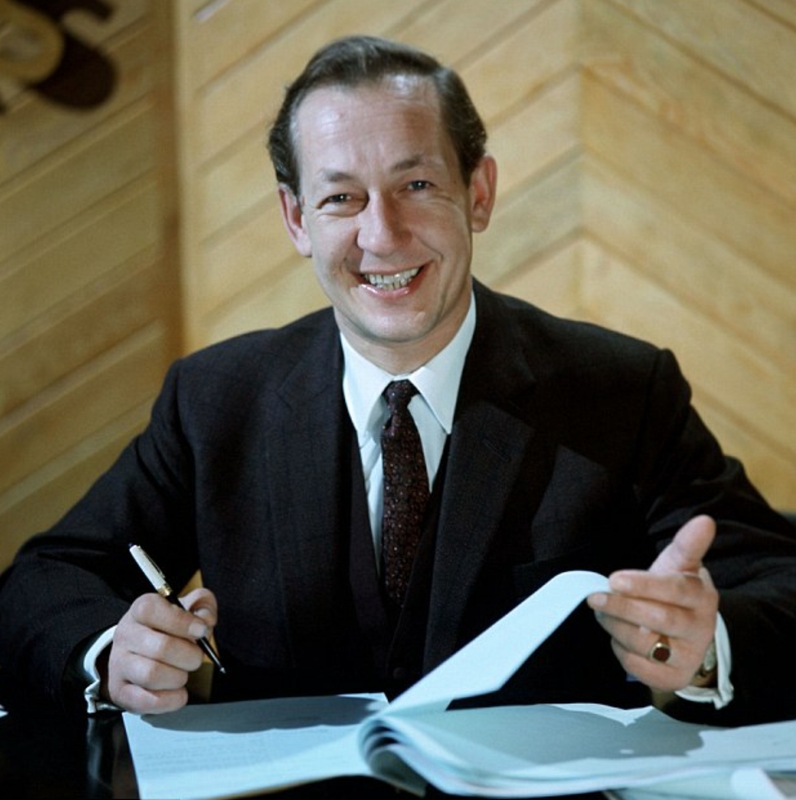 Brian joined the Beeb in July 1955, as announcer and newsreader alongside the likes of Jimmy Kingsbury and Robin Boyle who had also been at BFN Hamburg. Chances are you’ll still catch some of Brian’s announcements on the old comedy shows repeated on BBC Radio 4 Extra, here he’s introducing Hancock’s Half-Hour (1955) and Take It From Here (1957). 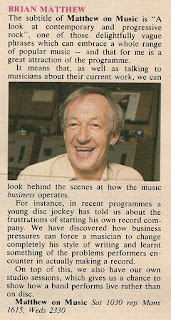 Brian had an interest in big band music and one of his duties was to compere a series featuring Johnny Dankworth and produced by Jimmy Grant. 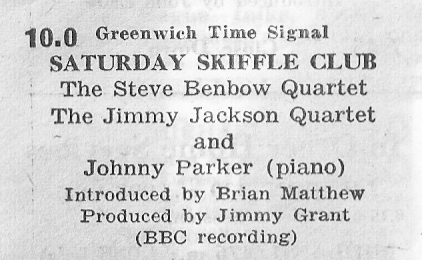 It was Jimmy who had the idea for a new music programme that would recognise the British skiffle revival of the time and Brian was to be the presenter – the show was Saturday Skiffle Club. Airing on the Light Programme from 1 June 1957 for just 30 minutes a week it proved a hit with listeners. It’s paltry budget of just £51 a show restricted the numbers and sizes of the groups that could perform and famously Lonnie Donegan’s fee of 40 guineas blew the budget and gained a rap over the knuckles for the show’s production team. When the interest in skiffle waned the programme transformed itself into Saturday Club from 4 October 1958 and now ran for two hours, in what would become its regular slot for the next decade, 10 am to midday. Musically it mixed skiffle, folk, jazz (Britain was now enjoying a trad-jazz boom) and rock ‘n’ roll. The importance of Saturday Club cannot be over-stressed. It introduced listeners to all the big stars on the music scene at a time when there were few outlets for popular music. 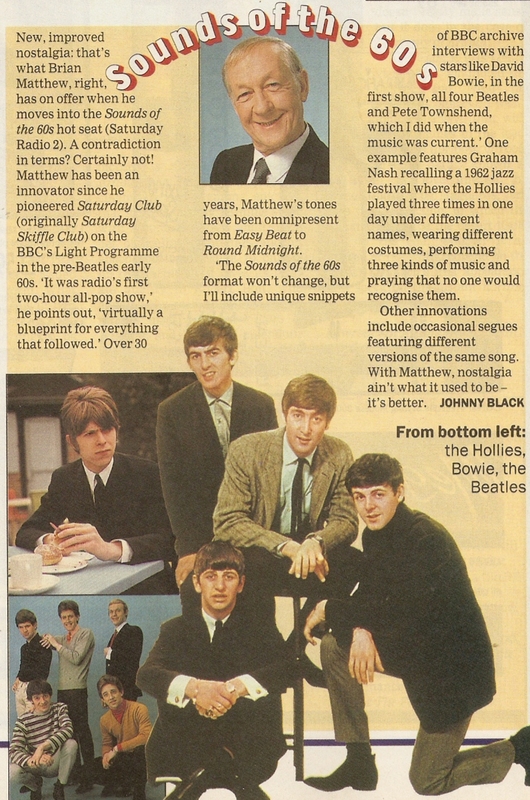 It came to define the BBC’s attitude to rock and pop in the heady days of the early 60s, until the arrival of Radio 1 in ’67. The sessions, those that survive, provide an invaluable archive of the development of British music as well as capturing some of the greats from America. It secured Brian a place in broadcasting history. Needletime restrictions meant that the two-hour show comprised of one-and-half hours of BBC recorded sessions and thirty minutes of records. Those appearing on the programme included Helen Shapiro, Cliff Richard, The Hollies, Kenny Ball, Dusty, Cilla, The Moody Blues, Manfred Mann, Georgie Fame and, from the States, Gene Vincent, Eddie Cochrane, The Everly Brothers and Roy Orbison. As a showcase for new artists Saturday Club was also vital in breaking The Beatles, so much so that although they only made ten appearances on the show Brian is inextricably linked with the loveable Scouse mop tops. The early 60s was a busy time for Brian. In 1961he became the presenter of ITV’s Saturday night answer to Juke Box Jury: Thank Your Lucky Stars. 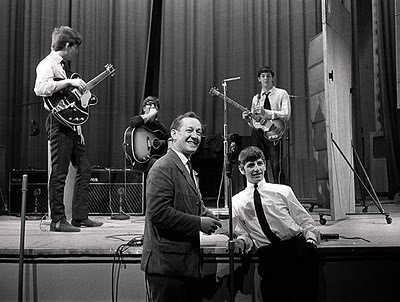 The show had started in the spring with Pete Murray compering, he was replaced by Keith Fordyce and then for a while Keith and Brian co-presented, but from November 1961 to June 1965 Brian was the face of ITV pop at the height of the Merseybeat boom. Thank Your Lucky Stars had a number of guest DJs slots over its run, now familiar names such as Jimmy Savile, Alan Freeman, Jimmy Young, Sam Costa, Don Moss and Kent Walton all appeared regularly. Aping its BBC opposition the show had a Spin-a-Disc slot with a teenage pop jury and made a star out of a 16-year old Janice Nicholls who would score the latest favoured pop release with “Oi’ll give it foive” – it became a national catchphrase. It was thought that only three editions of Thank Your Lucky Stars survived, but a 1962 programme turned up recently in the treasure trove of recordings saved by the late Bob Monkhouse. Let’s hope that one day some of Bob’s old tapes and films get an airing on television. Brian was also a well-known voice internationally thanks to the BBC Transcription Service that sent its discs to radio stations around the globe. From 1964 Brian was the main presenter of the radio version of Top of the Pops which re-used BBC sessions from other domestic programmes, such as Saturday Club, interspersed with Brian’s recorded announcements. Top of the Pops ran until the 1990s  although Brian ceased to be involved from the 1980s. The discs, which stations should, in theory, have returned to the BBC for destruction, but many didn’t, are now very collectable. Another TS programme was Pop Profile which consisted of specially recorded interviews with pop stars of the day. Here are two examples featuring John Lennon and Steve Marriott. Like many DJs of the time there was insufficient work on the Light Programme so appearances on Radio Luxembourg’s shows, recorded in their London studios, also helped pay the bills. Brian would host Brian Matthew’s Pop Parade, Speedy Disc Show, World Top Pops and Midnight with Matthew. During the sixties Brian also found time to cut the odd record such as a duet with Maureen Evans of Goodness Gracious Me – hear it on the Embassy Records tribute site. Also worth looking out for is the short film UK Swings Again that I caught last year on Sky Arts. It features somewhat static studio performances from The Animals, The Swinging Blue Jeans, The Hollies, Lulu and others all introduced by hip and happening DJs Brian Matthew, Alan Freeman and Kent Walton. Back at the BBC Saturday Club was continuing to pull in the listeners, in 1966 the show reported a domestic audience of 8 million supplemented by those overseas who could listen in on the British Forces Network (later the British Forces Broadcasting Service) and the General Overseas Service of the BBC (later the World Service) that carried the show for 30 minutes. Here’s your “old mate” Brian introducing the fifth anniversary programme on 5 October 1963. 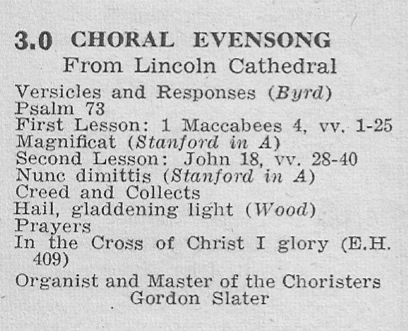 This recording is a repeat broadcast as part of Radio 2’s celebration of the Light Programme on 29 July 1995. At the same time that Saturday Club was on the air Brian presented a new Sunday morning recorded music show, Easy Beat. 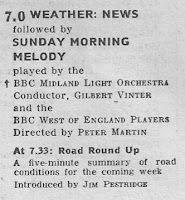 Starting on 3 April 1960 it had a musical remit similar to its Saturday counterpart, something of a shake-up for Sunday morning listeners who had previously enjoyed or endured Sandy Macpherson at the organ and a sequence of light music in Simple Melody. Brian would present Easy Beat for three years before handing over to, yes you’ve guessed it, Keith Fordyce. During the latter part of its run in 1967 the host was David Symonds. On 16 July 1964 the Light Programme launched a new late-night pop show, Top Gear, with Brian in the driving seat. 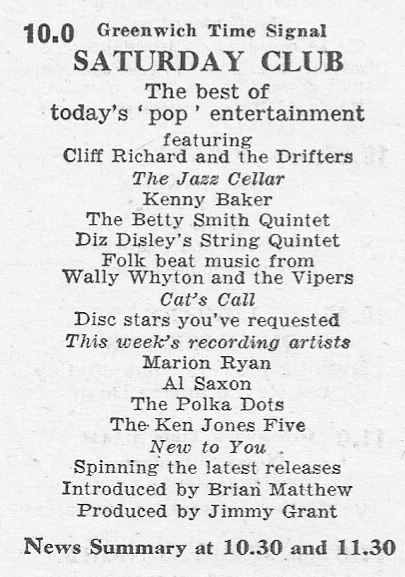 Billed as “an express delivery of pop packages and discs” that first show included Producer Bernie Andrews described the show as being “sharper” than Saturday Club, “in other words it didn’t mix skiffle, trad-jazz, early rock – it was pretty hard rock right from the word go.” For programme one The Beatles who obliged with some programme trailers. Top Gear ran until 24 December 1964. The following week, New Year’s Eve, Brian was seeing in 1965 with New Year’s Revels. 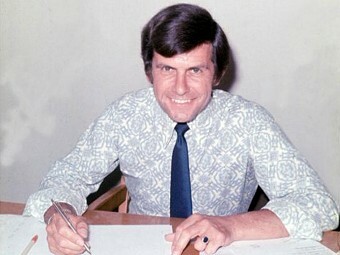 Bernie Andrew would revive the Top Gear title at Radio 1 in 1967 as a programme for John Peel. Brian’s last Saturday Club was on 23 September 1967. The following Saturday Radio 1 was launched and perhaps he was seen as too old for the thrusting new network. As he said some years later “The guillotine keeps on coming down but it’s never quite reached my neck.” Saturday Club remained on Radio 1 for another 16 months under the guidance of Keith Skues and finally Tom Edwards. We now enter a period of nearly a decade when Brian would not be associated with any one main programme, a period that often gets overlooked in any biogs. But come the big network changeover he was still on the BBC, now over on Radio 2 in its first week as one of the regular hosts of Roundabout, the drivetime (although such a term was not used back then) show that had been running since 1958. Brian would work on Roundabout, it never had one permanent presenter, until it got the chop in March 1970. At the same he was also taking turns on the daily record review show Album Time, this would run until September 1972. In 1970 Brian also popped up on the Saturday morning LP Showcase and on Tuesday evenings on Late Night Extra. During 1972 and 1973 Brian was still on Radio 2 as one of the presenters of the weekday early evening magazine show After Seven. The show had a different host each day and included some well-known names like Ray Moore, Michael Aspel, John Timpson, Cliff Morgan, Alan Freeman, David Jacobs and Desmond Lynam. If ever there was a natural person to narrate the story of The Beatles it was Brian. 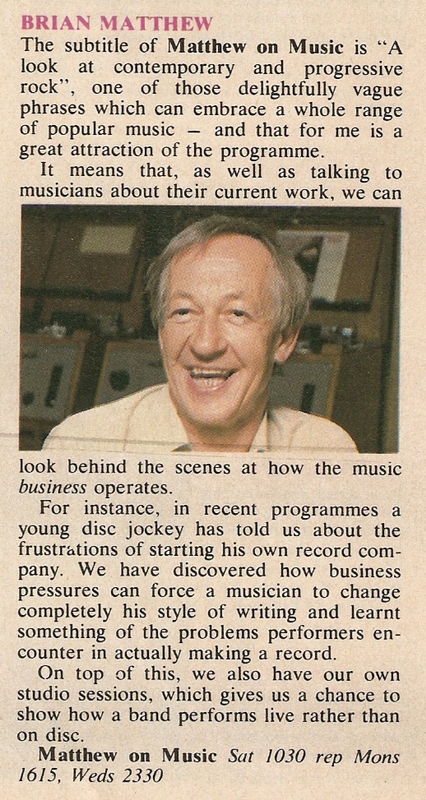 So in 1972 he was also working over at Radio 1 on the 13-part series that would eventually be sold around the world. The following year saw the start of Radio 1’s answer to Desert Island Discs: My Top 12. In each show pop stars and those in the pop business would chat to Brian and choose their Top 12 records, presumably twelve just to fit the hour-long format. The show ran intermittently over three years with Brian’s final guest in December 1976 being Joan Armatrading. The idea was revived, initially as My Top 12 and then My Top 10, in 1983 with Andy Peebles as the interviewer. Brian was also an occasional contributor to the Radio 1 documentary strand Insight (1975-76), with programmes on Joe Meek and the Midlands music scene. Meanwhile over on the BBC World Service a couple of years later he would host the “contemporary and progressive rock” show Matthew on Music (1978-1980). From January 1977 Brian was working exclusively on Radio 2, where he’s remained ever since. In fact it was full circle and back to the big bands as his first regular assignment was as host of Band Parade, taking over from Teddy Johnson , and handing over the microphone to Colin Berry the following January. In ‘77 Brian was also the regular cover for any holidaying jocks, sitting in for Terry Wogan and Jimmy Young. Around this time the BBC was making plans for the wavelength changes in November 1978 and looking to extend Radio 2’s broadcasting hours back to their mid-70s position with a view to going 24-hour. In 1977 the day’s broadcasting closed with the 11pm to midnight The Late Show, with staff announcers  taking it in turns to host each day. (Over on Radio 1 medium wave and ‘borrowing’ VHF was John Peel). That changed from January 1978 when Brian took over as the permanent host of The Late Show. In fact the very first show went out on a Bank Holiday Monday from 11pm to 2am under the title Around Midnight. Here’s a clip of that opening programme. For the next three months it went out as an hour long The Late Show. 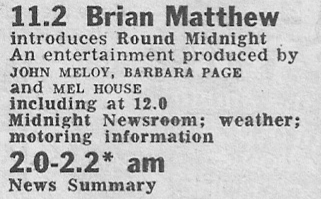 By 3 April 1978 Radio 2 reverted back to 2am closedown and Brian’s now 3 hour show gained the title by which it would become popular and well-respected, Round Midnight. It was an attempt to re-create the mix of music, chat, reviews and interviews that Late Night Extra had brought to the early days of Radios 1 and 2. It developed from a mainly music based show into an arts magazine with a 60:40 music to speech ratio. Round Midnight wasn’t just studio-bound and outside broadcasts from arts festivals and theatres were common; an annual fixture involved moving the show north for the fortnight of the Edinburgh Festival. Brian always retained an interest in theatre – he had extended his home in Chelsfield, Kent to include a stage and seating for 50 so that he and Pamela could host their own productions. The above constituted just over an hour of airtime. On the music side the BBC still relied on a fair amount of in-house recordings by its own orchestras on shows such as Round Midnight – the Radio Orchestra, the Big Band and the Midland, Northern and Scottish Radio orchestras were all heard on the programme. This reduced the amount of needletime for music played on disc over the 3 hours to about 40 minutes. This is how Round Midnight sounded on 18 February 1985. Parky claimed to have “lost on points” every time he interviewed Muhammad Ali. Here’s Brian’s effort in 1980. Sitting in on Round Midnight when Brian was on holiday were, amongst others, Peter Clayton, Russell Davies and Richard Stilgoe. Brian Matthew also had the honour to be the last voice on Radio 2 1500m long wave just before it switched over to Radio 4 on the evening of 22 November 1978. New network controllers are apt to wield their new management brooms and when Frances Line took over from Bryant Marriott in 1990 it was Adrian Love’s afternoon show and Round Midnight that got the axe. “It’s time to do something different in the evenings” she told The Sunday Times. This was something of a shock to Brian who’d been told that his show was “one of the jewels in the radio crown”. Round Midnight closed its doors on 29 March 1990 with an emotional goodbye from its host: “excuse me while I just nip out the back”. But that guillotine didn’t quite touch the neck again as just a couple of days later Brian Matthew was back with Sounds of the 60s. This programme had been running on Radio 2 since 1983, initially presented by one Keith Fordyce and then a number of guest presenters including a return to the Beeb for Simon Dee. Brian’s first Sounds of the 60s aired on Saturday 31 March 1990 initially running for just an hour, a new series Sounds of the 50s with Ronnie Hilton started that same day. Meanwhile the station’s coverage of the arts was picked up in a new series called, somewhat unimaginatively, The Arts Programme with Sheridan Morley being the main presenter. Sounds of the 60s was able to mine the rich seam of BBC session archives that Brian had presented first time round 30-odd years previously, along with a mix of classic records and obscure tracks. Seemingly Brian is destined to constantly relive that decade. You can catch the show every Saturday between 8am and 10am but for all you “avids” out there here’s part of the A side of a show first heard on 14 September 2002. My Top 12 guests included (that I have been able to track down) Neil Diamond, Johnny Mathis, Alex Harvey, Johnny Nash , Ray Stevens, The Bee Gees, Manfred Mann, Gerry Marsden, Mickie Most, Noddy Holder, Eartha Kitt and Barry Mason, Bruce Johnston, John Miles, Buffy Saint Marie, Demis Roussos, David Soul and Linda Ronstadt . A few sports stars crept in such as Claire Francis and Joe Bugner. The Late Show - in the final week of December 1977 the announcers were Don Durbridge, Ruth Cubbin, Tim Gudgin, Sheila Tracy and Len Jackson. 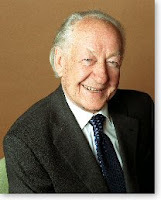 Saturday Club – Saturday Jump written by Jimmy Grant and performed by Humphrey Lyttelton and his Band. Re-recorded version by Ted Heath and his Music used later. Since I wrote this post in 2012 Brian continued to present Sounds of the 60s to a hugely appreciative audience. However, in November 2016 Brian was unwell and so Sir Tim Rice stepped in to look after proceedings. Thereafter, matters start to go awry for the BBC. In January 2017 the Corporation announced that Brian had agreed to step down and that it felt like the "right time for him to step off the weekly treadmill of presenting the show". The shows fans were in uproar, all the more when it was compounded by an interview in the press with Brian stating that this was "absolute balderdash" and that he was more than willing to carry on. The following month it was announced that Tony Blackburn would be taking over SOTS and that - again much to the consternation of regular listeners - it would start two earlier at 6am. Brian did, however, return for one final time on 27 February. A series of further specials was announced starting on Easter Sunday. To make matters worse on 5 April the BBC announced that Brian had died earlier that day, an announcement that was quickly retracted a couple of hours later when it transpired that whilst he was ill in hospital, he was very much alive. Sadly just three days later the news came through that Brian had passed away. A true radio veteran would be heard no more. Here's Brian's final Sounds of the Sixties. In 2012 Jim Moir celebrated Brian's career in The Brian Matthew Story. From your old mate Brian Matthew, that's your lot for this week. 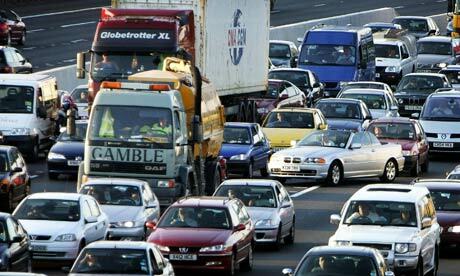 With Sat Navs and phone apps there’s no shortage of realtime traffic data but many motorists still rely on the radio. In this post we’ll take a leisurely drive (although in reverse gear!) through the history of national radio traffic bulletins. Last year on the R2OK Forum the question was posed about traffic news on Radio 2 – when did they start and have they always been on the network? The consensus of other posters, myself included, was that they always been on Radio 2 but that dedicated news reporters had only been on air since “Sally Traffic” joined in 1998. Over on Radio 2 the voices of Sally Boazman, Lynn Bowles and Bobby Prior are as well known as the DJs. "One of the things I felt really needed changing was the travel news...we decided it would be a good idea to have a dedicated travel newsreader to collect and announce information twice an hour. Jude Howells, who had produced The AM Alternative with me on Radio Five, remembered how well I'd got along with Sally Boazman on GLR. We'd never actually met as Sally broadcast down the line from a studio in Scotland Yard. A meeting was set up and we hit it off straightaway"
At that time there were already fixed travel news bulletins, though not as many as today. In 1998 in the morning you could hear bulletins at 06:40 and 07:10 during Sarah Kennedy’s Dawn Patrol and 07:50, 08:20 and 08:50 during Wake Up to Wogan. In the afternoon they restarted at 15:50, then 16:20 and 16:50 during Ed Stewart’s show and during Drivetime at 17:20, 17:50, 18:20 and 18:50. Over on Radio 2 from the 1980s listen to Terry Wogan, David Hamilton and Ray Moore. 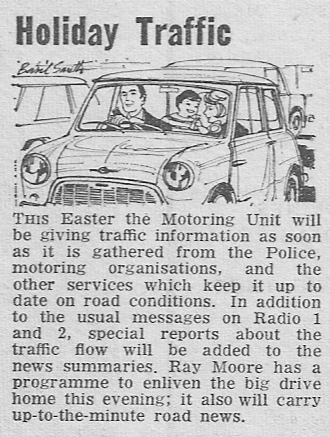 Traffic bulletins were certainly around in the late 60s, here’s Ray Moore on Breakfast Special in 1969. The billing for Breakfast Special reads "with resident bands and singers of the week, discs, news, weather and traffic reports." Reports were read as and when they became available with no fixed bulletin times. For many years, of course, they relied solely on police and local authority reports into the BBC’s Motoring Unit so they consisted mainly of planned roadworks and major motorway incidents. There was even an ominous sounding Radio 1 Motorway Fog Alert jingle dating from 1976, though nobody can recall it ever being used on air. 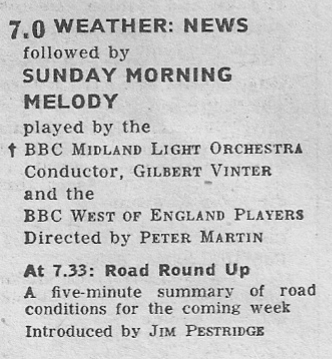 Back in the mid-60s the then equivalent of Drivetime was Roundabout and that too had traffic reports. Writing in early 1967 the producer, Brain Willey, said "It's very much a family programme for all age groups and tastes - but we do have the motorist specially in mind. Hence those last-minute flashes on traffic jams and hazards. Again, we remember that drivers hear music more distinctly than speech, so we give a slight boost to voice volume". Holiday traffic can ruin a bank holiday getaway as anyone knows who’s been stuck on the A303 near Stonehenge or the A64 to Scarborough. Not surprisingly holiday traffic reports seem to have been a regular radio service for many years. 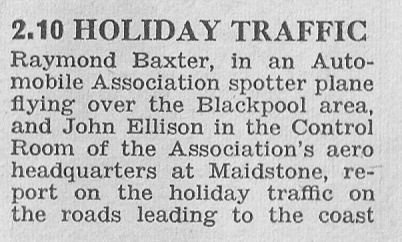 In 1958 on the August Bank Holiday the Light Programme included Holiday Traffic with Raymond Baxter (of Tomorrow’s World fame) and John Ellison. You may have used the TP or TA function on your car radio that automatically detects any local travel bulletins, preceded by three bleeps (above) on commercial radio stations. This uses Radio Data Systems technology that has been around since the early 80s. But in 1971 the BBC’s Research Department was testing a service that they called “Carfax”. This was to be a dedicated traffic information service used to transmit bulletins with no linking material in between. Carfax was to employ a single medium wave channel and have a new network of low-powered transmitters. One of the drawbacks is that it required the installation of a special in-car receiver. Though successfully trialled the project was pulled as a suitable operating frequency couldn’t be negotiated and it would have been too expensive to implement at a time when the Corporation was facing cutbacks. Its the Radio Data Systems Traffic Message Channel (RDS-TMC) that is used to send up-to-date traffic information to your in-car navigation display or sat Nav. The signal is sent out on Classic FM's frequencies by Traffic Link, which is now part of the American owned INRIX Inc.
For those popping over to the Continent you may recall that Radio 2 broadcast Cross-Channel Travel bulletins just after the 8 am news at the weekend during the summer months in the late 70s. Shortly after the tunnel opened in 1994 a Channel Tunnel Radio service went on-air to provide information to those approaching the tunnel and ports, this closed in September 2000. 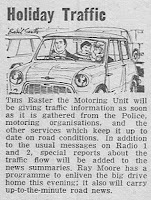 More recently another specialised service, Traffic Radio, went online and on digital radio. Run by Global Traffic Network on behalf of the Highways Agency it was on-air between 2007 and 2011, the plug being pulled as part of the Government's cuts. So there you are, no firm conclusions reached but I hope you enjoyed the journey. Happy Motoring et Bonne Route. The sad news of the death of Bob Holness has been announced today. Bob was a regular radio broadcaster from the 60s through to the 90s and, of course, the host of Blockbusters. Bob’s radio career started in his native South Africa, though the family had returned back to the UK just after his birth, with his first job being in 1955 as a radio actor. As trivia fans will know he played James Bond in an adaptation of Moonraker. He transferred into presentation and DJ work before moving back to Britain in 1961 where he joined Granada TV working of World In Action and hosting Junior Criss Cross Quiz. At the same time he was DJ'ing from the London studios of Radio Luxembourg. 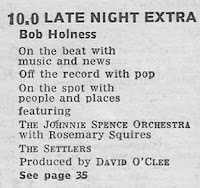 By the mid-60s Bob was working on BBC radio. On the Light Programme he popped up on Housewives’ Choice, Newly Pressed, Swingalong, Playtime and Roundabout. 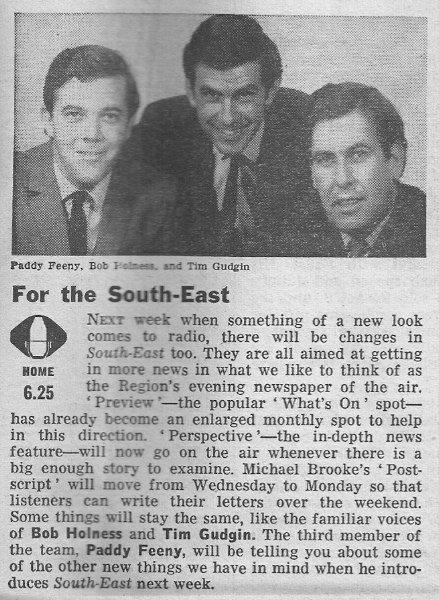 Over on the Home Service he was one of the presenters of the regional news programme South-East, working alongside Tim Gudgin and Paddy Feeny. When Radio 1 and Radio 2 started in September 1967 Bob was on air in the first week as a regular host of the Late Night Extra, and he continued to work on the show until 1974. It was during this time that Bob also became a teatime favourite on Central TV’s Blockbusters - “Can I have a P please Bob?” and the Blockbusters hand jive surely ensuring his place in TV history. I posted a short clip of Blockbusters on my You Tube channel last year. 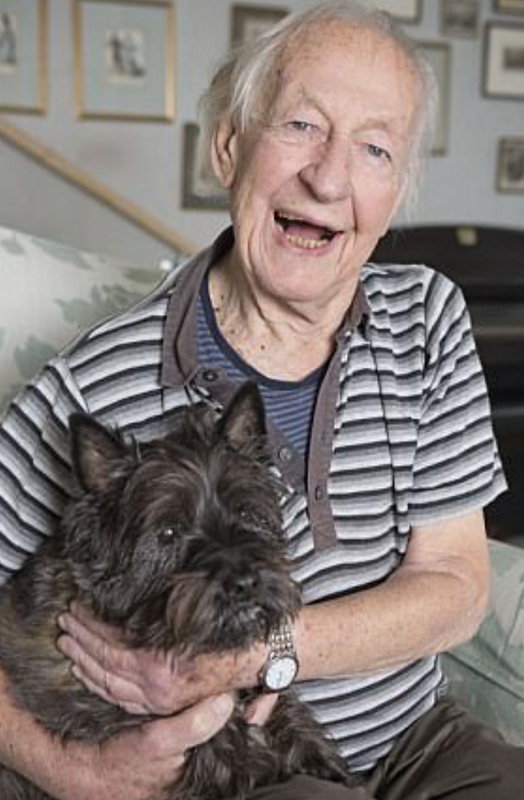 Back on the radio Bob was heard every week on the BBC World Service with the request show Anything Goes that ran from the mid 70s to the late 90s, prior to that he also presented Date with a Disc. In 1985 he returned to the Radio 2 to front shows with the BBC Radio Orchestra and sitting in for holidaying DJs such as Desmond Carrington and Derek Jameson. 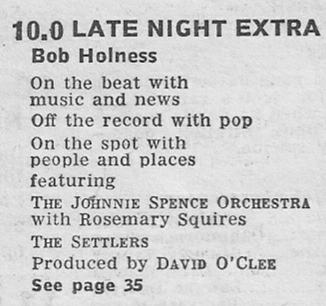 In the early 1990s Bob had a live Saturday night entertainment show Bob Holness Requests the Pleasure. Here’s his show from 4 January 1992 with guests John Dankworth, Don Maclean, George Melly, Madeline Bell and the Max Harris Orchestra. 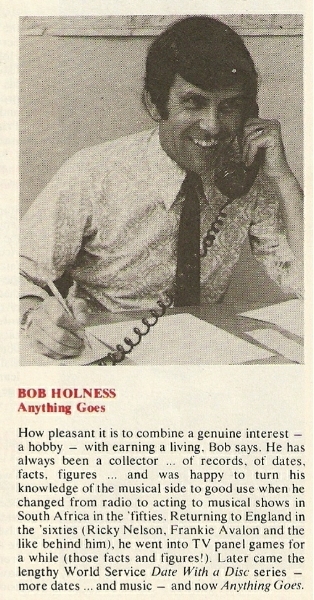 This recording amply demonstrates Bob's warm, easy-going style. 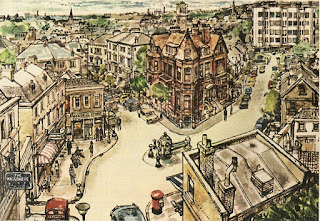 Time for another trip to Hampstead to meet the inhabitants of Waggoners’ Walk. The daily series was first broadcast by BBC Radio 2 back in April 1969 as a replacement for long-running The Dales (formerly Mrs Dale’s Diary). Although meant to be a bit more hip and happening than its predecessor, the Radio Times for that week, went to great lengths to assure listeners that the new serial’s setting was familiarly suburban. Far from being a vast impersonal spread of urbanisation the greater part of London is still divided into hundreds of separate communities which, despite the fact that they are so closely crowded by their neighbours, preserve an atmosphere which is as individual as that of a country village. Many of them indeed were villages-as some of the older buildings and the eccentric street plans testify so eloquently. Some have retained enough of their old character to have become tourist attractions in their own right. But the majority are not quite so picturesque, and their atmosphere is only appreciated by those who live there. One of the latter is Waggoners’ Walk. (You won’t find it on any street map.) It’s small as communities go-really only the cul-de-sac which is the Walk itself, and one or two hundred yards in each direction along the road which crosses the entrance to the Walk, in an unplanned sort of way. Beyond these very strict limits-well, one is simply somewhere else, even if the street signs and postal authorities don’t cater for such subtle distinctions. There have been a good many changes since the eighteenth century, when the sturdy man who gave the Walk its name used to pause on their journey uphill towards Hampstead to fresh their horses at the trough, and themselves at the inn-to which also they gave their name. The inn is now the oub, and has been modernised. Architects in the nineteenth and twentieth centutries have added variety to the Georgian terraces, each according to his own vision and resources. Social revolution has turned the biggest houses into small flats for the young and lowly paid, and the old mews cottages into luxury flats for the very wealthy. In these things, the Walk has much in common with its neighbours. Perhaps, after all, it is not the buildings but the people who live in them, that give an area its particular character. As in most areas of this kind, the inhabitants are not all Londoners by birth. Many of them are really quite recent arrivals, coming from all parts of the country, for different reasons, to make their home near the centre of the city. This perhaps explains the attractive individuality of so small a community. Perhaps it also explains why they find it difficult to give clear directions on how to get to the Walk itself. The new arrival may well lose himself on the way (even in the short walk from the station, for the roads are complicated) but once there he will soon find himself amongst friends. 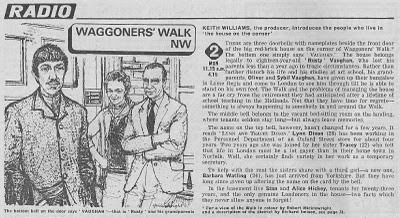 In the same edition of the Radio Times producer Keith Williams introduces us to the characters that live in the flats in the corner house on Waggoners’ Walk. In this initial scene from the first programme entitled Moving Pictures (very early episodes were given a title) you'll hear sisters Lynn Dixon (Judy Franklin) and Tracey Dixon (Rosalind Adams) along with their flatmate Barbara Watling (Heather Stoney). 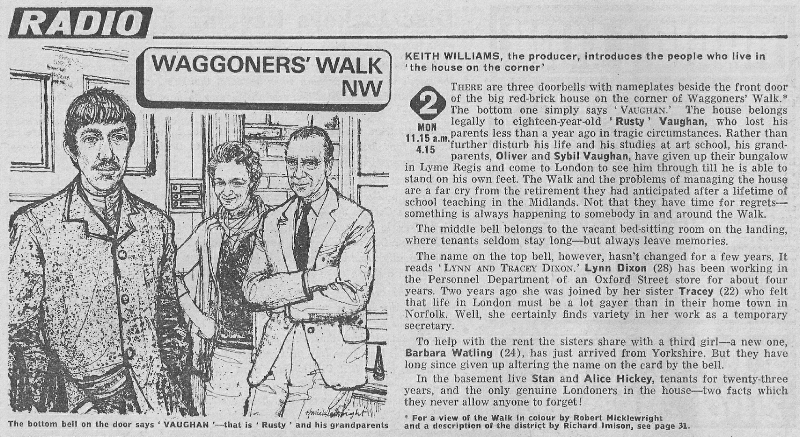 Waggoners’ Walk was dropped at fairly short notice as part of the financial cutbacks that the BBC had to make in 1980 – aiming to save £130m over two years. 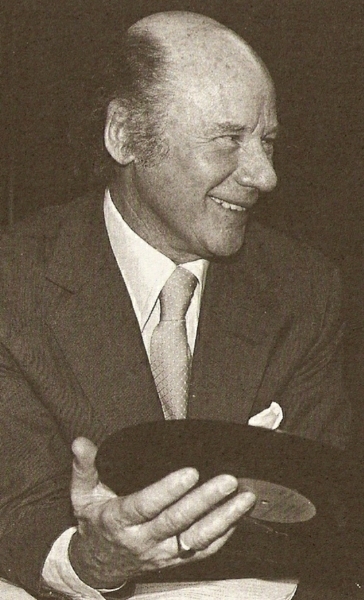 At the time actor Basil Moss, who played Peter Tyson, and others on the cast, were taken aback by the decision to axe the programme, claiming to have only heard of the decision on the radio news. So from the last couple of weeks of the series here are four more episodes of ‘Waggs’ together with a reminder about the link to the last ever episode previously posted by me in November 2010. Do you have any copies of Waggoners’ Walk? If so please contact me. You can hear more about Mrs Dales' Diary in the Radio 4 programme I'm Rather Worried About Jim on Monday 16 January 2012. Edited 13 January 2012. Thanks to Dave R.